We have a 6 month old male puppy who loves children (familiar and new at home or away), loves other dogs but is timid around adults. Children are all over him at parties,play overs and when I bring him to school. Dogs are his buddies even when little stupid ones growl and bite at him...he just stands there and wags his tail wanting to play. When adult visitors come over or we are away from home he is less than friendly. If we are home I try to introduce them with shaking a bag of treats and then getting down to his level and letting him come eat a few from their hand. He will do this but it a slow process... He hides under the table comes out for a quick nibble then retreats. Won't let them pet him on top of head only from under mouth. Then back to a bit of hiding and growling....if he does let them pet him every once in a while he turns his head around with an open mouth...no snap but afraid it might lead to a bite. Any suggestions? Re: puppy loves children but is scared of adults. Keep at him with limited attempts. He views children and other dogs as playmates. Adults are big and scary. 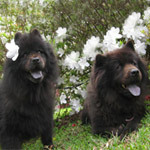 Most chows start as being headshy and the 'under approach' is actually the proper way to instruct others to approach them. Peripheral vision is limited and over head approaches can startle your pup. That is why they react that way. The head snap is not unusual, but not preferred either. You must get the dog used to being approached and touched. Teaching your guests the proper approach will go a long way, but the tolerance for children is a great sign. Wow, that sounds a lot like Ursa when she was a puppy. For the most part, she has outgrown it, but then I have spent a lot of time and effort socializing her. I am relating my experiences with her, and the biggest think that seemed to help her was when I got Malachi as a companion. The girls at the animal shelter thought he was a cute teddy bear, and they spent plenty of time with him which helped him develop an outgoing personality. When I walked the two of them together, he was not afraid of anyone, and eventually Ursa overcame her fear. I take my two out to dog friendly places (Petsmart, Tractor Supply and the many fund raisers our local shelter has). When I first started taking her out, I would take a small bag of kibbles for treats, and have her sit before letting people approach her. I also would kneel down by her to give some reassurance. I always had told people to approach her directly from the front and to touch her under her chin or on her chest. Dogs really do not like being touched on the head by strangers. Malachi does not really like me to touch him on top of his head whereas Ursa doesn't mind. It is a lot of practice, and observing your dog to make sure he is not stressed. Let him set the pace, and if he is not comfortable, do not try to let adults force themselves on him. Thank you so much for the advice. It is so great to get other Chow Chow owners perspective on this and really put my mind at ease. I have rescued different breeds from Rottweilers to Mastiffs and even a pug. Our family got this teddy bear from a breeder at 7 weeks knowing how important it was to socialize him with children as a puppy. With this we may have neglected him meeting enough adults:(.... I am anxious to try your tips. The idea that he views small children as playmates but is scared of adults because they are big and scary is pure genius! Thanks for that insight. Glad to know there is hope. Thanks guys! Chows are a different breed for sure. Socialization needs are similar to Rotties and Mastiffs, but they have their quirks. Chows have long memories, and in rescues they are often found to be particulary wary of men. Most likely caused by abuse/neglect issues, but they don't forget things. Ursa has it right. Take him out wherever you can. The box petstores are great, and you will feel like you have a celebrity dog when the families point out 'thats a chow, look at his black tongue'. At these stores most folk are well behaved and will ask permission to pet your dog. Great chance to introduce the dog to people and educate kids on 'approach', tell them its ok if the dog has earned that trust and then tell them how.